I confess I first published this cartoon way back in the early 90s as a small, weekday comic. But I like the joke so much that I felt it deserved a wider audience than I had back then so I redrew it and jazzed it up with 8 secret symbols for your amusement today. If you're having trouble getting the joke right off the bat, just keep studying the various elements and it should come to you. My favorite kind of cartoons are always the ones you have to think about for a few seconds. The good news is my new shop is still working so pop over there and get yourself something silly like an official Bizarro Jazz Pickle pin. Over on Wayno's weekly blog, he discusses where his head was at when he was constructing this cartoon. I encourage you to check that out. It won't take long because he's much less verbose than I. Coffee used to be a fairly simple drink that mostly appealed only to adults because it was so strong. But folks like Starbucks have changed it into a minor ingredient in elaborate, children's birthday party dessert beverages. Wayno is a big fan of "grown-up" coffee and even though I'm not a big coffee drinker anymore, we both agree that these super-sweet, parking-lot-carnival flavored drinks are an insult to the burros of Latin American who labor to carry coffee beans down from the mountains. 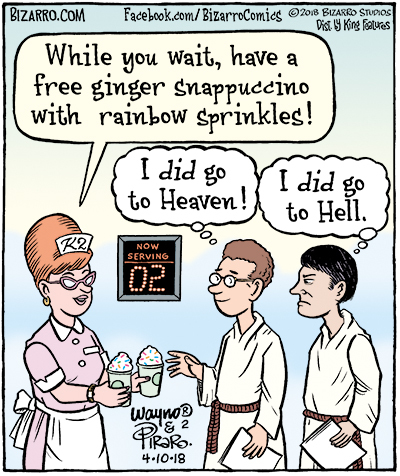 Below is an old Bizarro cartoon about coffee that I still think is funny. 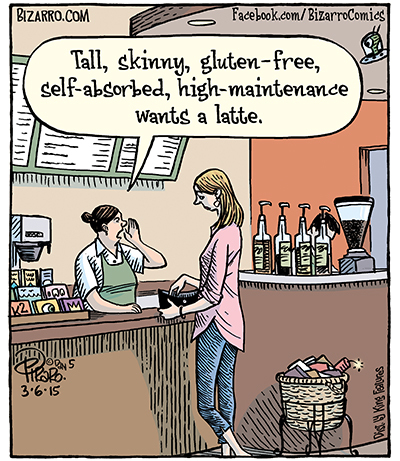 When I posted this cartoon on FB and Instagram this week, I got tons of complaints about "letting people order what they want". I guess they were mistaking my cartoon for some kind of government agency that is determined to control people's beverage preferences. To those folks I would say two things: 1) Sorry for the confusion. 2)What are you even doing on a cartoon site? 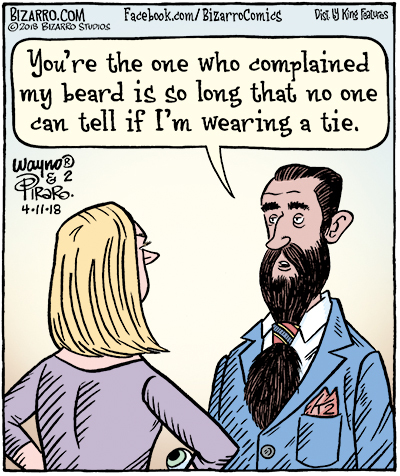 If my beard was as long as this guy's, I'd definitely start wearing ties this way. Could work with a bolo tie, too. Over on Wayno's blog, he asks Bizarro readers if they know the answer to an astronomy question that he's been unable to find info on. (No, it was not, "Is Orion also wearing a dance belt and how many stars does it have?") If you're into those kinds of stars, skip over there and see if you can help him. The URL is at the bottom of this post. Well done, partner––this is my fave cartoon of the week! Perhaps because I am not without my own stories of heart-breaking technology: My self-driving truck ran over my robot dog and my wife ran off with her self-loving, battery-operated wand. I think it is fair to say that Old MacDonald had a vowel fetish. Which is fine by me––hey, whatever turns you on. Although I don't trust people with fetishes for consonants because they're perverts. Thanks for tagging along this week, Jazz Pickles. Your readership means the world to us. Please have a look at some of our links below, which help to keep the lights on and the moat full of crocodiles. Till next time, be happy, be smart, be nice, and resist ignorance and fascism.